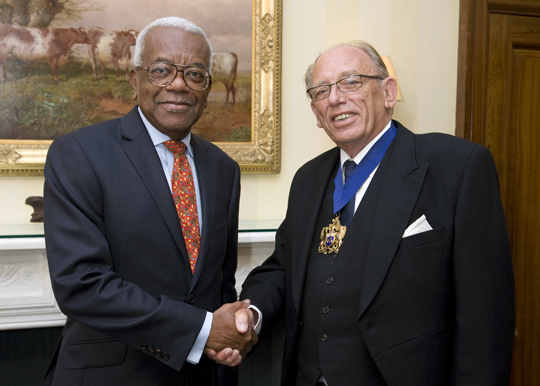 The September Court Lunch, held at Butchers’ Hall London, welcomed Sir Trevor MacDonald OBE as the principle guest. Sir Trevor said that it was his first visit to a Livery Company and that he was most impressed with his welcome, the surroundings, and the work of the Company. Guest speaker, Sir Trevor McDonald with The Master at the September Court Lunch. The Worshipful Company of Butchers stages the monthly Court Lunch normally on the first Thursday of each month and this provides a useful and enjoyable opportunity for Liverymen to associate with each other and entertain personal guests. Liveryman John Bausor proposed the guest and welcomed Sir Trevor to a packed Butchers’ Hall, giving some background to the veteran’s media and broadcasting career. In light hearted vein, Sir Trevor said how surprised he was that The Master had allowed a journalist into the proceedings, particularly in light of the well-publicised revelations coming from Leveson Inquiry. On a more serious note he talked about press freedom and how this freedom should come with responsibility. In a witty and well received speech, Sir Trevor regaled the lunch guests with various anecdotes including his experiences when interviewing Colonel Gadhafi and Saddam Husain. It was the last Court Lunch officiated over by the current Master Ray Woodhouse before the Common Hall elections on September 13th when a new Master and Court will be elected. In a farewell speech the Master said how much he had enjoyed his year of office and thanked everyone for such terrific support over the past 12 months. He also thanked Sir Trevor for making time in his busy schedule to visit Butchers Hall and for his most entertaining address.